Takeaway: A renowned corrosion expert provides a technical overview of changes to AS/NZS 2312, arguably the most important Australian standard on corrosion protection. The Australian/New Zealand Standard AS/NZS 2312.1:2014 "Guide to the protection of structural steel against atmospheric corrosion by the use of protective coatings – Part 1: Paint coatings" has recently undergone a major update. The Standard provides guidelines for the selection and specification of coating systems for corrosion protection of structural steelwork, being the main guide for coating specifiers in this part of the world since its predecessor first appeared in 1967. The section on corrosivity has been reduced because of the introduction of AS 4312 in 2008. Galvanizing and metal spraying have now become separate standards. The new AS/NZS 2312 Part 1 on paint coatings has been updated and edited to include new information on diverse subjects such as warranties, fabrication defects, recommended coating systems, maintenance and inspection. In addition, an Australian Standard on corrosivity has been released since the previous version2, and much of Appendix B in the earlier version—describing issues influencing atmospheric corrosion—has been deleted. Also, some clauses have been expanded and changed, but overall the document covers paint coatings only, so it should be easier to use. Table 1 lists the sections in the original standard and summarizes the major changes. "Provide guidance for architects, engineers, builders, the surface coating industry and users of protective services in general, on paint coating systems for the protection of steel work against corrosion." In its previous version of the Standard, the AS/NZS 2312 Committee directly adopted the ISO 12944-5 paragraph3 regarding the relationship between durability and warranty—namely that durability is a technical issue for maintenance planning, while warranty is a legal part of the contract. Although there are no definite rules that link the two periods of time, a warranty of about one-quarter to one-third of the expected durability should be the maximum expected. This clause remains in the new version. In recent years, there have been requests for longer and longer warranties. However, the Committee believes that extended warranties are not in the best interest of suppliers, contractors or owners and have expanded the arguments against these and provided guidelines for preparing warranties (Section 1.7). The other major change in the scope is a short section (Clause 1.9) on health, safety and environmental (HSE) issues regarding the selection and use of paint coatings. (For related reading on this topic, see Writing Safety Into Your Coating Specification.) The Committee recognizes that this is a major issue that would require many pages and additional expertise to adequately cover. Rather than produce a section that would inevitably omit important issues, or become quickly out of date, there is now a simple clause requiring users of the Standard to carry out any work safely and to abide by statutory requirements of the region in which they work. It is then up to the user to educate themselves on these important matters. Section 13 on health and safety in the earlier version has been deleted. With the release of AS 43124 since the 2002 version of the Standard, users now have much more detailed information and guidance on determining environmental corrosivity. The summary information in Section 2 has remained, but the discussion on atmospheric corrosion in Appendix B in the earlier standard has been greatly reduced. The C1 to C5 designations for atmospheric environments used in ISO standards and in AS 4312 have been adopted in the new standard to replace the earlier A to E categories. A new category CX (extreme corrosivity) for very high corrosion rates was introduced in the 2012 version of ISO 9223.5 This is mentioned in the new standard, but as there are few locations where this level of corrosion has been identified and the geographical requirements to achieve this environment have not been delineated, this category is not considered in the coating durability table. If such an environment has been identified, the durability of the system will be less than that given for the C5 environment. The change in the title of Section 3 to now include fabrication indicates the importance of this aspect of a structure with regard to corrosion protection. This section has been greatly expanded with more information on fasteners and fabrication defects. The Standard recommends the use of hot-dip galvanized bolts, stainless steel bolts in more severe environments (if galvanic corrosion can be controlled), or the use of PVC caps. The Standard also points out that damage to painted surfaces under the fastener is likely and recommends that only a thin coat of primer, ideally inorganic zinc, be used under fastener heads and nuts to minimize damage. In addition, the Standard contains details on fabrication defects such as sharp edges and weld defects. It provides details on welding defects that may arise and how they should be dealt with. Site preparation and THE coating of welds is covered in the section on maintenance (Section 8). The problems with sharp edges, including the requirements for rounding or chamfering, and dealing with gouges, shelling and laminations, are also covered. Of great importance is the comment that responsibility for the repair of defects must be made clear in the specification and other documentation. Ideally, defects should be detected and repaired by the fabricator before shipping to the coating applicator. Treatment of fabrication defects is also now included as part of the section on surface preparation (Section 4). 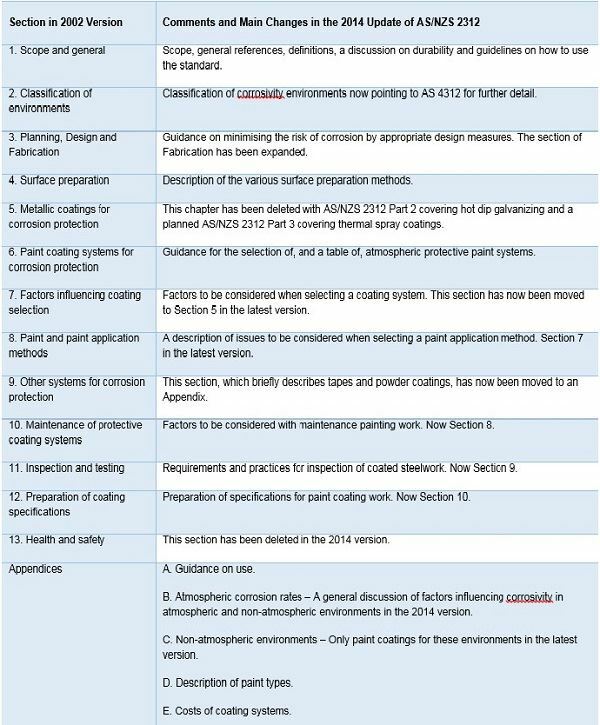 Section 4 on surface preparation has been edited and re-ordered, but with only minor additions. The useful clause on soluble salts remains, with few changes required despite this being a subject of much discussion, and more widespread specification and new standards & methods of analysis being introduced over the past 12 years. The clause points out the difficulty in determining acceptable figures for salt levels. It is interesting that the latest version of the NACE/SSPC water jetting standards have now dropped the three levels of "non-visible contamination" in earlier standards, undoubtedly in part due to disagreements over such figures. The useful clause on the problems with rust converters as a pre-treatment before application of high-performance coatings also remains. Part 3 is still under development and will cover thermal spray coatings. Having separate standards will make selecting and comparing coating systems a little more difficult for the specifier. But the increasing divergence between the many technical requirements of the galvanizing and paint industries made it impossible to produce a combined document acceptable to both groups. For example, design issues applicable to paint coatings are different from those affecting galvanizing. Abrasive blast cleaning is the surface preparation of choice for paint coatings, while pickling is generally used for removal of scale and rust with galvanizing. The chapter on coating application was irrelevant to galvanizing. Maintenance, inspection and specification requirements are completely different for the two coating types. Two separate documents concentrating on the distinct requirements of each protective coating should avoid confusion and misunderstanding. P. Golding, This conference, paper 128. R. A. Francis, "Development and use of an Australian atmospheric corrosivity Standard," ACA Annual Conference, November 2007, Sydney, Paper 037. Also R A Francis, "AS 4312: An Australian Atmospheric Corrosivity Standard," Steel Construction, Vol 45(1), December 2011. ISO 12944 Paints and varnishes – Corrosion protection of steel structures by protective paint systems – Part 5: Protective paint systems, International Organization for Standardization, Switzerland, 2007. AS 4312 Atmospheric corrosivity zones in Australia, Standards Australia, 2008. ISO 9223 Corrosion of metals and alloys – Corrosivity of atmospheres – Classification, determination and estimation, International Organization for Standardization, Switzerland, 2012. R. A. Francis, "A critical comparison between AS/NZS 2312 and ISO 12944 standards for coating selection," Corrosion and Prevention 2008, Wellington, NZ, Paper 076. AS 4361.1 Guide to lead paint management, Part 1: Industrial applications, Standards Australia, 1995.